The much awaited TUF 12 is now handing out tickets to the general public. The on-sale will be this Friday while for the Fight Club members, their pre-sale starts Thursday. Good News! The tickets for The Ultimate Fighter 12 is now on sale this week. The event will take place on December 4 at the The Pearl at the Palms Casino Resort in Las Vegas, and the night’s main card airs on Spike TV. 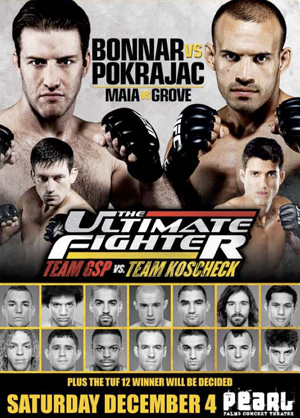 Aside from revealing who deserves the TUF 12 award, the event also features light heavyweights Stephan Bonnar vs. Igor Pokrajac and middleweights Demian Maia vs. Kendall Grove. Tickets will be on sale to general public this Friday, Oct. 8, at 3 p.m. ET (noon PT). A pre-sale period will begin Thursday at 1 p.m. ET for members of the UFC Fight Club. The Ultimate Fighter 12 Finale is the second-to-last event of the year for the UFC and 2010’s final Spike TV show. It will go face to face with “Strikeforce: Henderson vs. Babalu,” a Showtime-televised event that will take place at St. Louis’ Scottrade Center with a Dan Henderson vs. Renato “Babalu” Sobral main event.